It’s Official (Finally) – We Won! Mission Two Complete, Mission Three Underway. 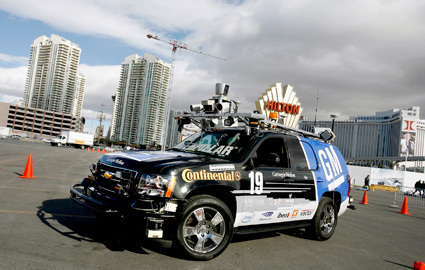 "If We Were to Give a Ranking..."
Tartan Racing’s Boss, the robotic SUV that won the 2007 DARPA Urban Challenge, will be quite busy next week. On Monday, Boss is tentatively scheduled to appear on NBC’s Today Show with Tartan Racing’s director of technology Chris Urmson. Check your local listings for the time and channel. Boss will also be appearing next week at the Consumer Electronics Show in Las Vegas in conjunction with a keynote speech by GM CEO Rick Wagoner. And later this month the Urban Challenge champ will be making appearances at the Detroit and Washington, D.C., auto shows. DARPA Director Tony Tether made it official this morning: Tartan Racing’s Boss is the winner of the Urban Challenge and will take home the $2 million first prize. This wasn’t a surprise to the team. We knew that Boss ran a clean, safe race and Tether was quoted last night to that effect. And we knew Boss was fast. But it sure is good to hear Tether say we won. The order of finish was the same as the Grand Challenge of two years ago – Stanford first, Carnegie Mellon second. But this time, the final outcome may be different. Though Tartan Racing Boss started more than 20 minutes after Stanford this morning, it was only a couple minutes behind at the finish. Now, we don’t know how much either vehicle was paused by DARPA officials during the day, but it is reasonable to assume that Boss made up a whole heap of time on Stanford and the rest of the field. Virginia Tech’s Victor Tango, the first vehicle to start, was third across the finish line, about 6 minutes behind Boss. Three additional vehicles are still on the course. DARPA officials will be examining their score cards this evening to determine how well each robot drove. If Boss or any of the robots are judged to have driven unsafely or illegally, those robots likely won’t be bringing home any prizes. We won’t know who won this race or event or whatever you call it until DARPA Director Tony Tether meets with team leaders at 8 a.m. PT Sunday. The winners won’t be publicly revealed until a ceremony at 10 a.m. But it was a remarkable run, no matter the winner. “Thank YOU, Chris,” shouted back team member Sam Harbaugh. The crowds are gathering again on the grandstand as, at 1:35 p.m., we get ready for the first robot to cross the finish line. In all likelihood, that will be Virginia Tech’s Victor Tango SUV. But that’s only part of the story. “Ladies and gentlemen, do not assume that the first vehicle to cross the finish line is the winner,” the grandstand announcer noted. “This is an event, not a race.” Which is to say, the fastest finisher isn’t necessarily the winner. How well the robots drive will be critical to the final score. At about 1:20 p.m., for instance, Victor Tango could be seen parking in the parking lot, but pulling only partially into the space before backing out. Will that count against the team? How much will it count against the team? No one outside of DARPA can tell you. OK, maybe finishing the Urban Challenge in less than six hours is more attainable than it seemed an hour ago. Boss just completed mission two, finishing in about an hour. Some team members speculate that things seem to be moving more rapidly on the course now that some of the less capable robots have been retired for the day, lessening the need for pauses. Boss just left the starting chute to begin the third and final mission. About 12:10 p.m. or so. A roar arose from the crowd gathered around the video monitor in the Tartan Racing tent. At about 12:30, the Webcast showed two vehicles with the bumpers touching and one of them was a dark Chevy Tahoe. A second look confirmed that it was Cornell’s Tahoe, not Boss, that was touching fenders with MIT’s robot. And we’ve since been treated with several shots showing Boss toodling along, with two-thirds of mission three complete. We hear from (usually) reliable sources that our friends and fans in Pittsburgh have packed the Adamson Wing of Baker/Porter Halls today to watch the Webcast of the Urban Challenge. We appreciate your support. Thanks for coming. DARPA keeps saying that the robots will complete about 60 miles during the total Urban Challenge and must finish in less than six hours to be eligible for a prize. But based on unofficial times (our wristwatches) all of the teams that have completed mission one took more than two hours. How will they complete three missions in six hours? The first caveat, of course, is that we don’t really know our mission time. DARPA has repeatedly paused the robots – sometimes all of the robots simultaneously, sometimes individually, or in pairs. Sometimes the pauses are to remove obstructions, or relieve traffic jams. Sometimes we don’t know why. The pauses don’t count against our elapsed time, but we don’t know how long Boss has been paused. Occasionally, we’ve been caught behind slower vehicles. Even so, Bryan Salesky, the team’s software lead, said the maximum speeds that DARPA has set for various parts of the course will make it difficult for any robot to complete 60 miles in six hours. Which brings up one more thing we don’t know – whether the Urban Challenge will really be 60 miles long, or if perhaps DARPA will shorten the course. From what team members can tell, however, Boss is running fine and, when possible, running as fast as possible. Boss finished its first of three missions at about 10:50 a.m., returning to the starting chute in the grandstand area. Team members loaded the electronic instructions for the next mission into Boss’s computer. But then Boss just sat for awhile, finally launching at 11:03 a.m. Other teams have been turning around the missions in as little as five minutes, so the wait was unnerving. But the launch decision is made by DARPA officials, so the time spent waiting won’t count against the robot’s elapsed time. We catch glimpses of Boss when we can and everyone was delighted when the DARPA Webcast showed Boss plowing through an off-road section of the course that connects an “urban” area of the course to the perimeter highway here. The team had been concerned about this stretch, but it looks like Boss is handling it with aplomb. It’s thrilling to be in person to see these driverless vehicles moving at speed, but getting a real sense of what’s going on in this race requires remote viewing. The course includes 10 miles of roads, many of them meandering through an old suburban-style housing section. No one vantage point provides a comprehensive view. Once the start was over, the thousands of spectators who had been in the grandstands dispersed to various venues. None is more popular than DARPA’s cavernous event tent, where several large video screens show the Webcast of the race. In the Tartan Racing pit, the Webcast is being shown in the hospitality tent donated by Chip Ganassi Racing. Boss, judged best of the bots during qualifying, was supposed to be the first robot out of the chute at today’s Urban Challenge. But in the first surprise of the day, it ended up 10th. It turns out that the honor of being in the first chute proved fatal to our GPS sensor. The combination of radiofrequency interference from a Jumbotron erected next to the No. 1 chute and the radio interference from the line of eight robots behind Boss that were waiting to enter the start area fried Boss’s GPS, forcing the pit crew to replace and reset it. That meant that Victor Tango, the Virginia Tech entry, started first, followed by Stanford, Penn’s Ben Franklin team, MIT, University of Central Florida, Cornell and Oshkosh. The Honeywell/Intelligent Vehicle Systems entry started 8th, but immediately hard trouble, turning back toward the chutes; it was paused and placed back in the chute. Team Annie Way started next, followed – finally – by Boss. Once underway, Boss looked like the champ its been all week, moving quickly and smartly to the start chute. The Urban Challenge is a race, so the talk on race eve is all about winning, not to mention the $2 million first prize. But the point of this enterprise remains the technology and, from that perspective, we’ve already won. Or so say the executives of three Tartan Racing sponsors, who met the press Friday afternoon in the team pit. The technology that enables Boss to drive itself could someday be used to automate mining trucks and other heavy equipment that operates in dangerous environments, for instance. The technology certainly will enhance safety, agreed Larry Burns, vice president of GM research and development and strategic planning. But it also can help reduce congestion, reduce traffic delays and generally make driving more enjoyable. “Boss really moves us much closer to realizing our vision,” he said. “At the end of the day, the real winners here will be the consumers. Of course, we’d also like to win the race. The winds were relatively mild during most of Boss’s qualifying runs, but weather forecasters say the Santa Ana winds will re-assert themselves on race day. The wind kicked up noticeably on Friday and tossed up a fair amount of Victorville sand. “It might not affect human drivers, but it might affect some sensitive sensors,” said Tartan Racing leader William “Red” Whittaker on Friday as he addressed a group of military officers who were visiting the Urban Challenge pits. Sometimes, sand can look like an object to a robot’s sensors. Because of this concern, Tartan Racing ran a special test on Tuesday to see if it made sense to turn down the sensitivity of its short-range lidars. The team ultimately opted not to make a change. Tether said DARPA could have accommodated up to 24 teams in Saturday’s event, but in the interest of safety settled on just 11 teams. In addition to Tartan Racing, they include Stanford, Virginia Tech, Germany’s CarOLO team, Cornell, Penn, MIT, University of Central Florida, Team Oshkosh, Intelligent Vehicle Systems of Troy, Mich., and a largely German team based in Palo Alto, Calif., called Team Annie Way. Starting time for the race has been pushed back an hour to minimize interference between the rising sun and the vehicle sensors, so the opening ceremonies will start at 7:30 a.m. PT and the first robot is supposed to leave its starting chute at 8 a.m. PT. Tether said DARPA hasn’t determined the order in which teams will start the race, but each will be set off on a different “mission,” and so will be heading in slightly different directions. Each robot will need to complete several missions and so will, return to the vicinity of the starting area about 10 times. So it won’t be too long, he predicted, before robots begin to encounter each other in traffic. Tether is particularly intrigued by the possibilities when two robots approach each other from opposite directions. “That will be the first real test where I’ll be holding my breath,” he said. DARPA Director Tony Tether spoke with reporters on Thursday, revealing a few more details about how Saturday’s Urban Challenge will unfold. Tartan Racing’s Boss and 10 other robots that will start the race, but no decision has been made about the order of the start, he said. Things will be orderly as the event gets underway, with each robot being sent out in different directions, “but it’s going to get random pretty quickly,” he predicted. That’s because each robot will need to complete a series of “missions” during the course of the event, so each will return to the vicinity of the starting areas at least 10 times. So it’s inevitable that robots will begin encountering each other on the road, perhaps even creating a robotic traffic jam. The robots won’t be alone on the road. About 50 professional drivers in Ford Tauruses equipped with NASCAR-type roll cages will be on the course to create traffic. 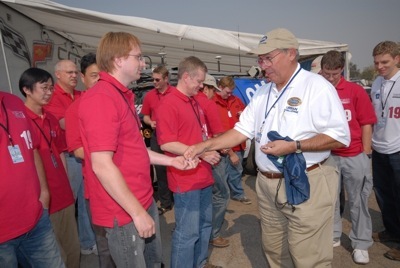 Tether said it was important to have well-trained drivers on the course because of the unpredictability of the robots. “They all know how to get out of the way,” he said. The robots must complete the 60-mile course within six hours to be eligible for the prizes -- $2 million, $1 million and $500,000 for first, second and third place. But the winner won’t necessarily be the fastest. DARPA hasn’t been clear about how exactly it will score the race, but Tether said much of it has to do with the robots’ ability to follow California driving laws. A robot might turn in a fast time by only coming to rolling stops at stop signs, but that robot likely wouldn’t win the race. The reason, he explained, was his concern that some robotic vehicles simply weren’t safe. No one is sure what will happen when the robots begin to encounter each other in traffic during Saturday’s event and he said he wanted to minimize the risks of a robot-robot collision. “It would be terrible to have one bot take out another bot,” he said. The issue of safety was brought home to Tether late in the just-concluded National Qualification Event. He was in a vehicle that was following a vehicle as it made its way through the winding roads of Test Area B. Suddenly, the vehicle did a U-turn and headed directly at Tether’s vehicle. “Five of us in the vehicle were all yelling ‘pause!’” Tether recalled, referring to the pause command that DARPA could send to a vehicle. A safety driver did hit the pause button and the vehicle came to a screeching halt about four feet from the front bumper of Tether’s vehicle. Saturday’s DARPA Urban Challenge final event will be Webcast live at www.grandchallenge.org, starting with the opening ceremonies at 7:30 a.m. PT (10:30 a.m. ET). That’s an hour later than originally planned. DARPA officials announced the change – intended to minimize problems that the sun can cause sensors on the robots – on Thursday. Our Pittsburgh fans can get together to watch the Webcast at 10:30 a m. ET Saturday in the Adamson Wing (136A) in Baker/Porter Halls on the Carnegie Mellon campus. The security guards on the perimeter road here at the former George Air Force Base got an eyeful this afternoon with two lines of cars, totaling about 20 vehicles, did a strange dance with Boss. It was an ad hoc experiment to help Tartan Racing sort out some issues regarding the vehicle’s SICK laser sensors. In test runs here in Victorville, the sensors caused Boss to mistake some dust clouds as objects. So the team wanted to know if they could turn down the sensitivity of those sensors enough so that the vehicle could ignore harmless dust without failing to detect truly important objects, such as other vehicles. So every available team member with keys to a car took to the road this afternoon. Separating into two groups of roughly 10 cars, they took turns driving in single file past Boss, which was driven by Chris Urmson. It was a strange sight for the guards, as well as the occasional motorist who found themselves in the midst of these processions. Luckily, no police were around to notice the multiple U-turns. The readings from the SICK sensors were recorded and now are being analyzed by team members. This type of experiment is something that the team has time to consider, now that Boss is officially in Saturday’s race and no further qualifying runs are scheduled. Tartan Racing was the first team to qualify for the Urban Challenge final event. DARPA officials, who earlier excused Boss from any further qualifying runs, told the team early this afternoon that Boss is in the race. By 3 p.m., four other teams – Cornell, Virginia Tech’s Victor Tango team, the University of Pennsylvania’s Ben Franklin Racing Team and Stanford – also had made the race. The word was not so good for six other teams. Georgia Tech/SAIC Sting Racing, Team Berlin, University of Utah, Princeton, SciAutonics/Auburn Engineering and an Indiana team called Ody-Era were all scratched today by DARPA. Boss took a second crack at the parking lot and narrow, winding roads of Test Area B on Monday afternoon. It's proven to be a tough course, with only Boss and three other robots completing it in the first three days of the NQE. This run included a couple glitches and took a few minutes longer than the initial run on Saturday, but, all in all, "it looked pretty darn good," said Chris Urmson, director of technology. The run was delayed for several hours while DARPA officials made changes in the course and because of glitches in DARPA's emergency stop system. Once underway, Boss was its typically aggressive self. At one point, Boss began backing up, eventually rolling up onto a curb. DARPA officials paused the vehicle but, with the road clear ahead of the robot, Tartan Racing members urged DARPA to put it back into autonomous mode. Boss moved forward safely. A bit further along the same street, near a line of parked cars, Boss backed up and moved forward several times, as if trying to avoid an obstacle. The vehicle eventually stopped this maneuver and was able to complete the run. Team members were reviewing data downloaded from Boss to determine what caused the unusual behaviors. "Maybe there's something to fix, maybe not," Urmson said. Boss’s ability to handle contingencies was tested in expected and unexpected ways this morning as the robot completed the third and final test run in the first NQE series. This run, which began at 8:18 a.m. Pacific time, was over a loop course in a former suburban subdivision, though much of the course could not be seen by spectators. The run tested the vehicle’s ability to handle four-way stops – determining which vehicles at the intersection have precedence and then taking its turn. That was no sweat for Boss. Things got more interesting about 13 minutes into the run. DARPA officials placed traffic barrels across the road, blocking Boss from reaching a checkpoint. Boss responded appropriately, figuring out an alternative route and then executing a perfect 3-point turn to reverse direction. When Boss found its new route also was blocked it began another 3-point turn, pulling up on the far curb and then backing up. It only needed to turn left to complete the turn, but Boss was indecisive, sitting motionless while turning its front wheels left, right, left, right. To members of Tartan Racing, watching from a few hundred feet away, it was if Boss was waving at them. After about a minute and a half, a DARPA official came over to ask the team what it wanted to do. They opted to do nothing. Boss was well aware of its lack of progress, explained Chris Urmson, director of technology. After a certain interval without progress, Boss knows it must re-plan its actions. Just moments after the DARPA official asked the question, Boss began moving again. It completed the turn and, in short order, the test run as well. But as the team learned later, Boss’s movement had nothing to do with a new plan. What happened, explained Dave Ferguson, the team’s planning lead, is that Boss kicked up a cloud of dust as it backed up. The vehicle’s sensors interpreted the dust as an object. Unfortunately, the cloud of dust also entered into Boss’s blind spot. So, when the dust settled, the sensors no longer showed any obstacle, but the vehicle’s brain still had to assume that there was an obstruction in its blind spot. Perceiving its way blocked, Boss refused to move. Luckily, the “waving” of the front wheels must have moved Boss just a tiny bit – enough to reveal part of the blind spot. That’s when Boss realized there was nothing in its blind spot and began to move again. It was a scenario the team had never seen before; changes are being made so Boss doesn’t get flummoxed like this again. Still, Boss encountered few problems in Area C. “All in all, another excellent run,” Urmson said. This afternoon, Boss will begin the second series of NQE test runs, which continue through the end of the NQE on Wednesday. Boss will repeat Test Area B, where the robot must maneuver around obstructions in narrow, winding roads and park in a designated spot in a parking lot. Boss nailed its first run in Area B on Saturday morning, but most other teams have failed to finish their runs there. Boss delivered another strong performance on Day 2 of the NQE. The test assessed the ability to handle cross traffic and oncoming traffic and to make safe left turns across moving traffic. The test is a variation of ‘chicken’ from the old days of hot-rodding, but this is played out with robots and humans sharing the road. A dozen human drivers created dense, two-way traffic and Boss found its way through it. Boss had to find gaps, choose opportunities to enter and cross traffic, and make its way around a ‘belt-buckle’ shaped course. Boss completed 16 circuits of the course in the allotted 25 minutes. That is best-yet, but more is possible, and some great competitors have not yet run this. The next-best performance so far is 11 circuits scored by Virginia Tech. “All in all, it looked like the vehicle did a kickass job out there,” Chris Urmson, director of technology, told the team when it gathered for a post-run briefing. During the test, Boss had to cross the belt-buckle on the center road while human traffic flowed continuously at every turn and every intersection. Boss had to repeatedly read and shoot the gaps. Too much boldness and Boss would disrupt traffic. Too much hesitation and opportunities disappear. A perimeter of jersey barriers encroach on the outer lane, so the course is tight and unforgiving – traffic or no traffic. The lanes are only 11-feet wide (versus the standard 14 feet), so Boss had to thread the gap between oncoming traffic and the rail. The team is analyzing these and other minor incidents to make adjustments. It is likely that Boss will face other tests on this same belt-buckle course during the week. It was the second strong performance for Boss. Two other teams - MIT and Germany’s Team Carolo – have completed the long, narrow, winding roads with parked cars and other obstructions in Test Area B that Boss aced on Saturday. Tomorrow, Tartan Racing will complete the first round of NQE testing at Test Area C, where vehicles display their ability for tight maneuvering, handling four-way intersections and finding alternate ways to reach blocked goals. Members of Tartan Racing jumped to the aid of a competitor, Georgia Tech/SAIC Sting Racing on Saturday when that team's Porsche Cayenne ran head-on into the jersey barrier at Test Area A. The impact bent the front bumper and sensor railing, sending the Georgia Tech team scrambling. "They came over to our pit and asked if they could borrow a pipe bender or some sort of bender," said Tom Brown, a GM research technician. "I said, 'Absolutely, you're welcome to anything we have' "
And by that, Brown meant more than just tools. Over the next three hours, he helped the Georgia Tech mechanical team leader assess the damage and attempt to straighten the sensor bar. In one attempt, they strapped the bent sensor bar to the bottom of the team’s storage pod; while people piled into the pod to weigh it down, Brown used a hydraulic jack to push up against the bar, but to no avail. "We just couldn't get enough weight on it or enough pull against it," he said. Eventually, the vehicle was brought over to the Tartan Racing pit, where Brown worked with fellow GM research technician Dan Demitrish and Mike Haas, the driver of the Pratt Miller race trailer that has been supporting the Tartan Racing pit. They cut off the damaged parts, re-leveled them as best as possible and welded them back in place. “We got them within a few degrees of where they needed to be,” Brown said of the repaired parts, and the Sting Racing team was able to shim the sensor mounts to make the vehicle operable again. "It was a pleasure to help them," Brown said, noting GM engineer Hong Bae also chipped in on the effort. "My nightmare is what happened to them." On Sunday morning, an appreciative Sting Racing was able to run four autonomous practice runs and was preparing for a run at Test Area B on Sunday afternoon. Boss moved smartly out of its starting chute at 8:10 a.m. Pacific time Saturday, drove along the grandstands and out of the starting area as it began its first test run of the National Qualification Event. Team members, gathered atop the grandstands, craned their necks to catch glimpses of Boss as it negotiated a traffic circle and made a right turn, heading out of sight to what DARPA is calling Test Area B. It's a suburban-style housing section of what used to be George Air Force Base and DARPA is using it to test the ability of vehicles to navigate two-lane roads and parking lots. About fifteen minutes later, Boss re-appeared at the grandstand area after successfully completing its run. In the pits a half hour later, a review by the team of Boss' onboard video confirmed that it had turned in an impressive first run. "That was an awesome performance," said Chris Urmson, director of technology. It was another encouraging day at the NQE for Tartan Racing. On Friday afternoon, DARPA officials inspected and tested Boss's emergency stopping mechanism, the E-stop. The test was the same as the one during June's site visit in Pittsburgh and, as before, went off without a hitch. The team then spent some time doing calibration checks, practicing circumventions of traffic cones and performing other tests before retiring Boss for the day. Boss will be back in action Sunday morning at Test Area A, a large parking lot where DARPA will test the robot's ability to handle traffic.— human-driven cars. Unlike Test Area B, all of Test Area A is visible to spectators. Darpa's Tony Tether welcomed the teams, introduced their leaders this morning and talked about how the technology being pioneered for these Grand Challenges will ultimately save lives. DARPA director, Tony Tether, visited the team for the presentation of DARPA 2007 Urban Challenge coins for semi-finalists and a group photo. Intersection coordinates and other data that DARPA provided for the course were correlated by our team with aerial imagery. No surprises. The course looks great. Boss was motionless at the start of a shakedown session. The switch that governs motion had been turned off. When the switch was turned back on, Boss ran fine. The switch had been turned off for transport. Good catch. There is still a light smell of smoke in the air, but the haze has cleared, and it looks like a great week for the challenge.